Could jellyfish help clean our seas? This post is an idea post. It isn’t about the latest science (at least, not fully). Instead, it’s about a thought. Something I’ve been wondering about for a while. It started with a friend of mine. This colleague and friend helped discover something truly remarkable about jelly mucus. That’s right, jellies snot. Or slime. Or goo, whatever you want to call it really, and they produce lots of this mucus when stressed. And this mucus, it turns out, can trap nanoparticles of metal. These particles are 15 nm wide (that’s 0.000015 millimeters–small! ), and conventional water and industrial filters can’t trap them. But jellyfish mucus can clean them from the water. The study authors suggest jelly mucus could be used to help filter industrial nano particle waste. But while reading the article I kept flashing back to a very particular, and very messy, mistake. As a new jelly keeper I set out to build a super clean, super-filtering jelly husbandry system. I talked to fish aquarist and they all recommended this very specific and expensive brand of active charcoal. “It’ll absorb all the nitrogen” they said, “it’ll keep your water chemistry perfect” they said. So I got the extra big pack, rinsed it super well, then put it in the filter of my new jelly tank. I let the system run for a week, and added my first batch of stinging nettles. It was a disaster. Microscopic charcoal dust apparently does not bother fish. Or snails or crabs. Or any of the other aquatic animals it is regularly used with. But those microscopic particles and jellyfish? Gobs and gobs of black, gooey, stringy mucus. Floating everywhere in the tank. I took out the charcoal and siphoned out the goo, but the jellies would make more mucus, and day after day those thick clouds of mucus would be packed with black dust. I finally had to take all the jellies out and completely rinse the system. 70 gallons to drain, cycle, and refill. And then I did it again. And again. Because every time those jellies produced mucus that would trap even the most dilute charcoal particles and glom up the system. But is this just something jellies do in captivity? Soak up nano particles, charcoal dust, and other fine pollutants in their defensive mucus? I wonder if jellies are constantly scrubbing the water around them, trapping tiny particles in mucus that sinks to the sea bed. And this is only one hypothesis for how jellies may help clean the ocean. The very movement of their bodies may help disperse concentrated patches of oil and other sticky pollutants. Brad Gemmell, a scientist at the University of Texas at Austin, recently began a new research program to test the hypothesis that jelly movement may help disperse oil after spills. Jellies may act as tiny mixers, diluting polluted water and mixing dispersants with oil slicks. And mucus can’t be forgotten–jelly mucus is full of nutrients that oil-eating bacteria need to grow. 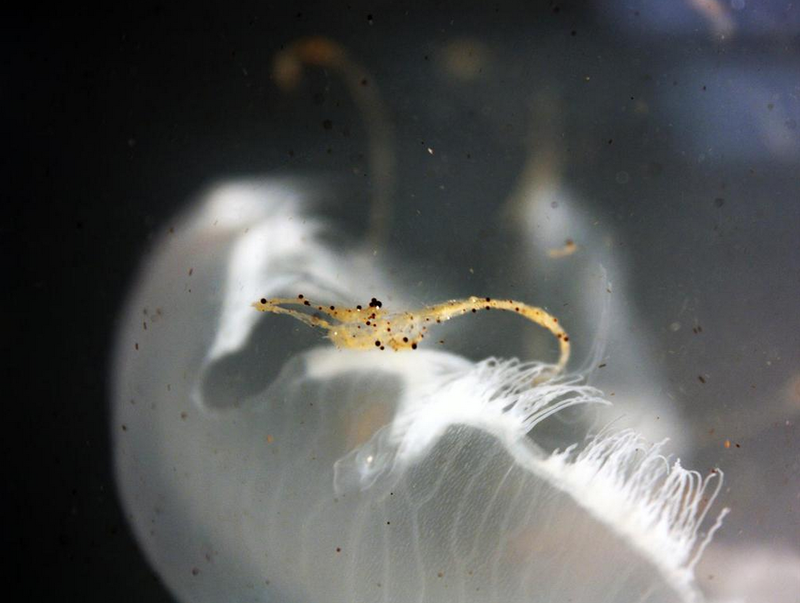 Stressed jellies in an oil spill may boost oil digestion by bacteria. As far as I know these ideas are still just that–ideas. We don’t know much about jelly movement and mucus in the wild. We do know jelly mucus can capture nano particles in the lab, and Dr. Gemmell did present some of his findings at a recent conference (but they aren’t public yet). So for now these are just thoughts to ponder. I will say this–with all the nets to rid beaches of jellies, and jelly killing robots, wouldn’t it be nice to discover that jellies are in fact aiding humans more than we know? We have so much left to learn about jellies and their role in the environment. And it wouldn’t surprise me one bit if jellies help way more than they hurt. I use an active Charcoal bags as made by Sunset Marine Labs in my Moon jelly tank. I have not seen that problem. Do the Moon Jellies not demonstrate this mucus production? Congrats on your Doctorate and Position. I really enjoy your blog.